The true meaning of “local” is much more than a tagline. This week, you’ve probably read a handful of news articles that discussed a place, whether it be a house, restaurant, or park. The author may have described the place in detail with a street address or vaguely with the neighborhood it’s located in. Either way, they’ve done their job to describe its location to you, a human. However, the clarification of the location must go a step further in order for it to take advantage of new opportunities and technology. In 2012, a Pew Research study revealed that nearly 75% of mobile users use real-time, location-based applications. This number has likely risen. These applications — such as Waze, Yelp, and Google Maps — work with data that relies heavily on addresses, latitude, and longitude. Because of this level of clarification, each of the apps are able to perform extremely useful tasks. Before this level of clarification was performed online, features like directions and maps were simply not possible. The technique that helps leverage location data in news articles is called geotagging. Some people may be familiar with this term, but everyone has experienced it on the web in one way or another. Geotagging online allows publishers to arrange their content from a very local context, capturing the true value of “local” and enabling anyone to understand where a story took place. I think the most socially-accepted, location-based services are dating apps — or at least they’ve received the most attention. As seen with apps like Tinder, the ability for users to discover information (people) nearby them is exhilarating. Sure, they may have different intentions about “learning” information, but let’s take a moment to compare this with a legacy-type dating service, Match.com. Match.com launched in 1995 and claims to have 59 million monthly active users as of Q3 2015. Tinder launched in 2012 and claims to have 50 million monthly active users as of Q4 2014 and with “100% year-over-year growth” seen between 2013 and 2014, the app is likely to surpass Match.com for 2015. These services have the same purpose — to recommend people — so why is Tinder getting much stronger attention in this short amount of time? The answer is its precision on geography. Tinder represents users as a geographic coordinate and is able to integrate proximity methods into its algorithms to get you the most relevant people. Match.com represents users as a city and, although gives relevant results based on geography, it’s not as precise as Tinder and is limited to its services. Imagine if Tinder organized users only by city, it likely wouldn’t be as… arousing. Now take this geotagging strategy and let’s look at the transportation industry. In recent years, we’ve seen how Waze and Uber have transformed the market by providing a more specific geographic service. The same concept can be seen evolving with chat apps, social networks, even food delivery services. When geographic information is leveraged, it enables brand new opportunities for that industry and we think it’s quite magical. By clarifying locations with more precision, news articles can more easily be treated as objects that can be recycled, reshaped, and redistributed to many platforms in many formats. They’ll be able to see the benefits that these other industries have reached. That’s the beauty gained from breaking down data with the intention to mobilize content. This is a data-first approach to publishing, in turn, improves the stability of “the message,” as mentioned in the Gutenberg Parenthesis. 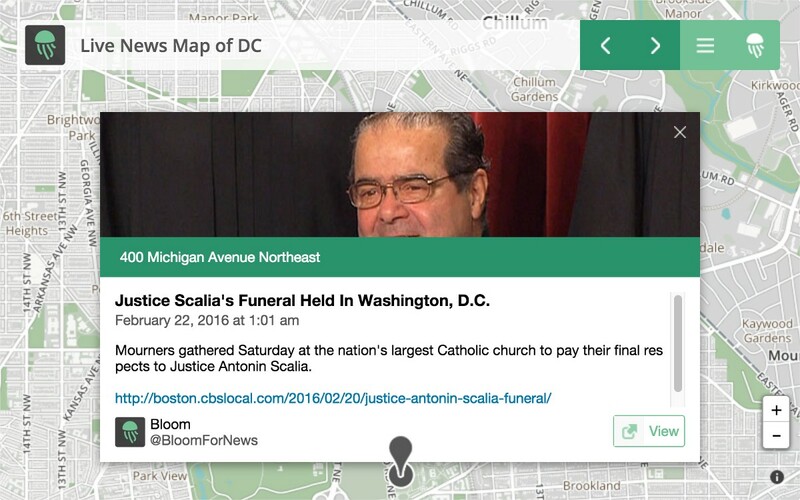 An interactive map that’s populated with news stories: take a look. With our experience of geotagging articles on Bloom, we’ve been able to see this impact by taking a single article and redistributing it in many formats using location data. For example, representing the article as a pin on a map, as a list in a live stream, or as a search result — all prioritized by its location. Geotagging as a plugin: Do you have a Wordpress website? Then you’re in luck. We’ll be releasing an update to our geotagging plugin later this month that will further simplify the process of attaching a location to a local news story. Local search: We’ll be re-releasing our local search plugin that will enable you to view any website from a local perspective. Rather than relying on what a news website serves on their homepage, you’ll be able to filter their content to read just what’s relevant to your current location. Do you see the Tinder resemblance yet? Intrigued? We’re looking for beta testers for these products and many more. Contact us to get your invite! Want to learn more about geotagging? Test drive our geotagging tool called Geo Metadata. Or, continue reading about geotagging in our blog article: Location Inconsistency and Geotagging.